Jason Mills with us for the first time sports a nice fresh dorado while fishing off Las Arenas with the Tailhunter Fleet. It was a little tougher on the dorado as waters are getting cooler, but the fish are still around and a great bonus species to be catching in December! 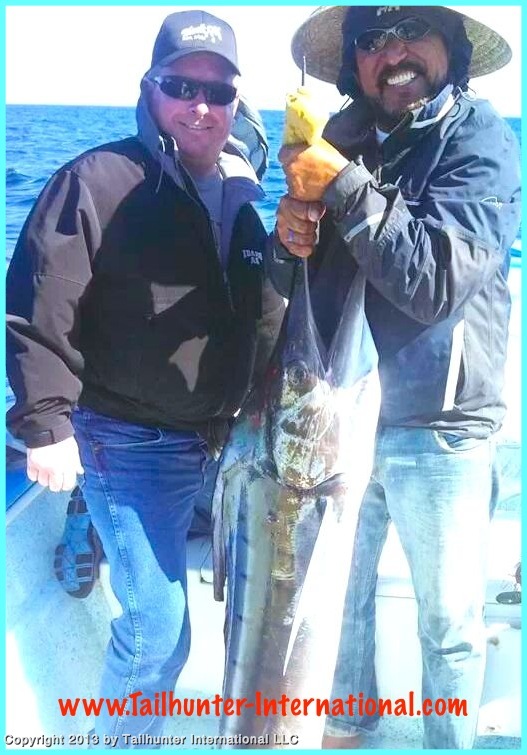 Ralph Shawver and Captain Jorge pose with another unusual biter for December, a striped marlin. It was Ralph’s first time with Tailhunters. The fish could not be released and was caught just south of Isla Cerralvo. It was a tougher pull this week for fishing around La Paz. After so many weeks of unseasonably good fishing for a variety of species, this past week was more typical of what we see around our area for this time of year. It was definitely chillier on the water. A few more grey skies in the morning and choppy waters. It was also much windier than in the past…perhaps the windiest week overall that we’ve had in awhile. Whether because of the cooler temperatures or because of the wind or a combination of both, there were fewer of the blue water pelagic species that have treated us for so many weeks unexpectedly. The marlin and dorado were much harder to find and the bite was sporadic. However, inshore, we did get into some nice jags of fun sierra which are always great sport and great eating as well as bonito which are great sport…and not such good eating! If you got into a school of sierra, limits weren’t hard to come by. As well, we surprisingly still got rooster fish. None of the big guys, but some fun 8-15 pounders which were a nice bonus and all fish were released. It looks like this coming week is going to be less windy so we have our fingers crossed for some better fishing! That’s our story! Wishing you all the best for a great 2014! 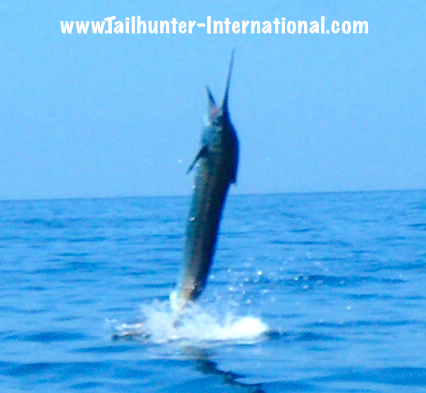 It was another surprising week of marlin running around our waters despite the fact that it’s WINTER! Usually, we stop seeing billfish around the end of October or so, but this year, they’ve been thick, hungry and willing to bite! 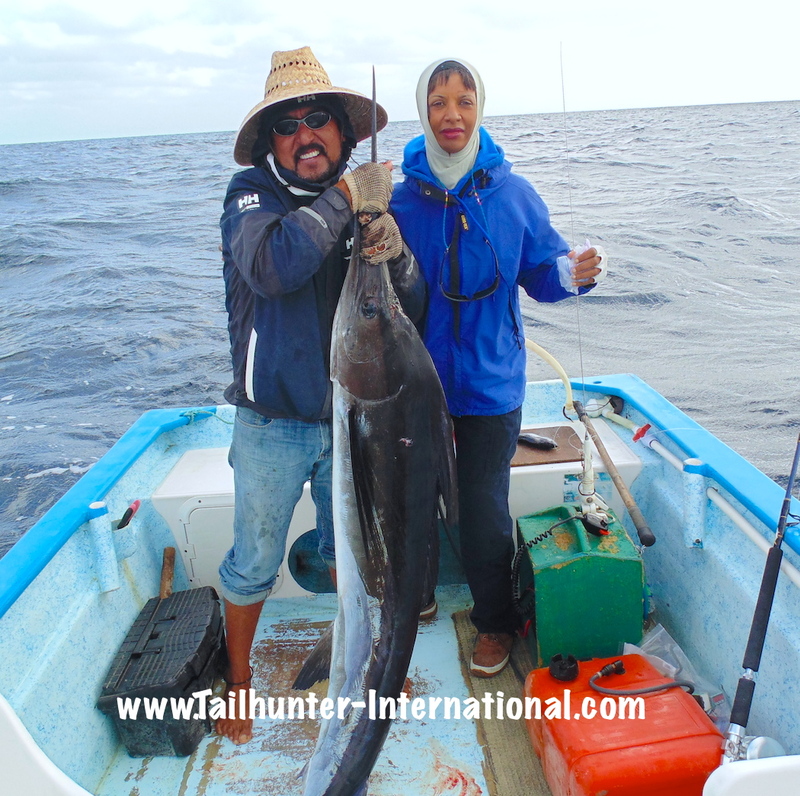 Verda Boyd, our amiga from the Bay Area near San Francisco, always rocks the fish and go this one with Captain Jorge just outside of Bahia de Los Muertos. Unfortunately, they were not able to revive this fish, but most of the billfish are getting released. 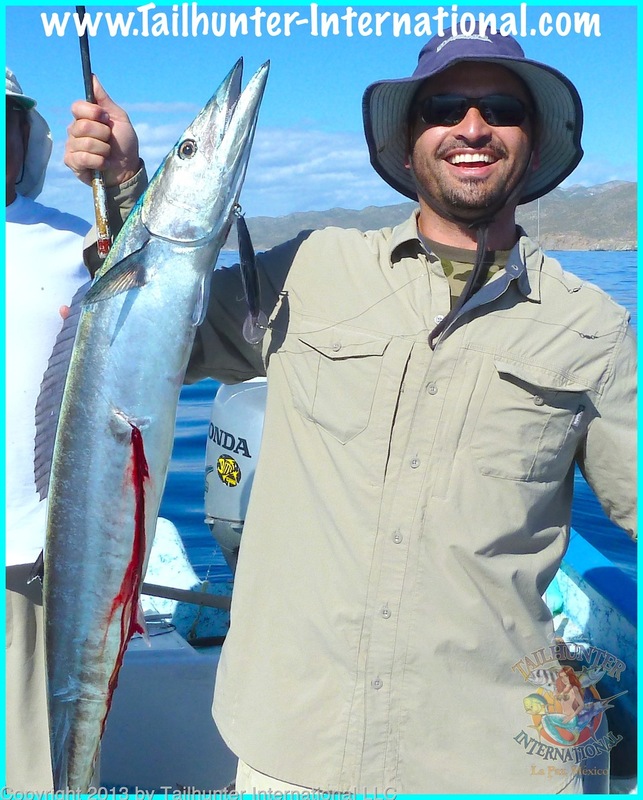 Another of the bluewater surprises this late in the season is the continued presence of dorado. Not big ones, but fun-sized school fish around 10-20 pounds like this one that Llew Williams caught with Captain Pancho off Las Arenas. It’s that time again! Just wanted to wish all our Tailhunter Family, Amigos and Tribe members a safe, happy and peaceful Christmas! God bless you all and best fishes always! WINDIER CONDITIONS BUT GOOD VARIETY OF FISH! Lots of variety this past week. After the stellar fishing we’ve had the past few weeks that surprised many of us, this week seemed to be a little more typical of what winter fishing is like in La Paz. It was breezy and a bit chilly even tho’ the sun was out most of the time. It was a tad choppy as well. All typical winter weather when fishing this time of year. However, the fishing had a really good mix of species with perhaps a bit more inshore fish than we had been getting which included nice bunches of sierra and cabrilla as well as bonito. However, the nice surprise again was the showing of striped marlin and other blue water species that we don’t usually see this time of year. 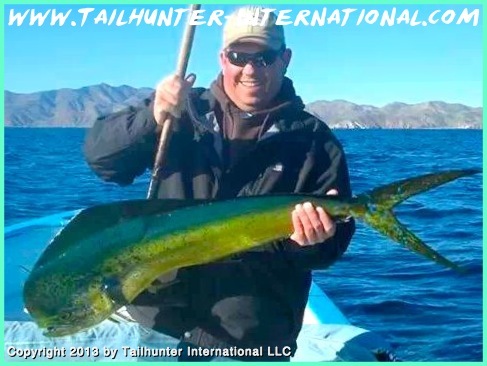 As well, we still have schools of 8-20 pound dorado cruising nearby and we had a few bites on wahoo once again although most bites were lost. 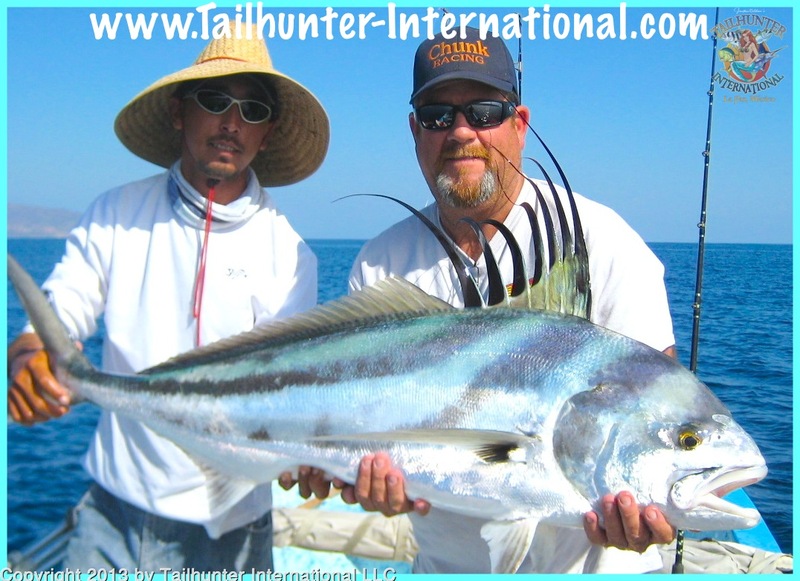 As well, we can’t discount that there are still nice trophy rooster fish up on the beach areas and in the shallows that are running 15-40 pounds and all getting released. All-in-all, not bad as we head into the first week of winter and the Christmas week! That’s our story! Have a safe, happy and peaceful Christmas and holidays. 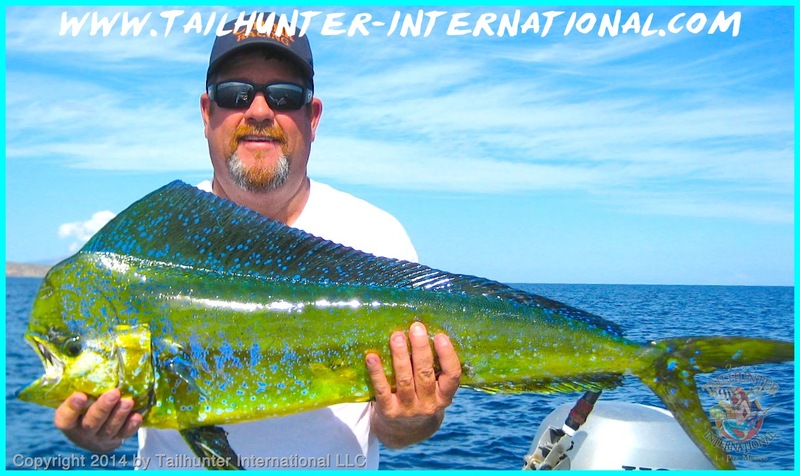 God bless and best fishes always from our Tailhunter Family to yours. 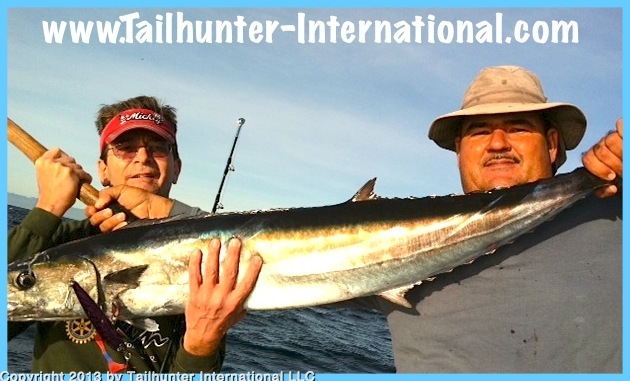 Tim Zimmer and a jubilant Captain Jorge of our Tailhunter Las Arenas fleet, hoist up this beefy wahoo off the south end of Cerralvo Island in the early morning. Great way to start the day and more evidence of the great blue water fish we’re still experiencing this past week! Can you tell it’s winter in La Paz? Our Florida, amigo, Llew Williams, has been fishing with us for many years and came to fish with us in December this time. Never expecting to catch dorado, wahoo and this big trophy rooster he’s trying t cradle so he can take a photo and release it. That’s Punta Perrico and the old Hotel Las Arenas in the distance. 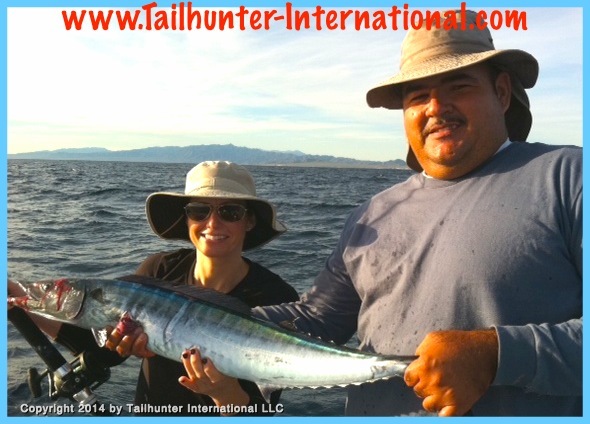 Captain Gerardo is a big big fella so his size somewhat dwarfs Julie Gragg and here nice wahoo she caught on her first time fishing and visiting La Paz! I think this is Verda’s 3rd time fishing with us this year. She’s a gangbuster angler from the East Bay of San Francisco and shows off a nice rack of sierra, a dorado and a cabrila. She also got a marlin as well. Great dorado photo with Steve Medley who caught this good-looking young bull just outside of Bahia de Los Muertos. COOLER WEATHER WITH WARM WATER FISH! And that’s pretty much how it went this week! Again, another surprise fishing week. It was windy and definitely cooler with some gray skies as is typical of fishing this time of year and we highly recommend not to forget bringing a jacket aboard. But, the fishing the last few weeks has definitely NOT been seasonal. We did get sierra and cabrilla for sure. 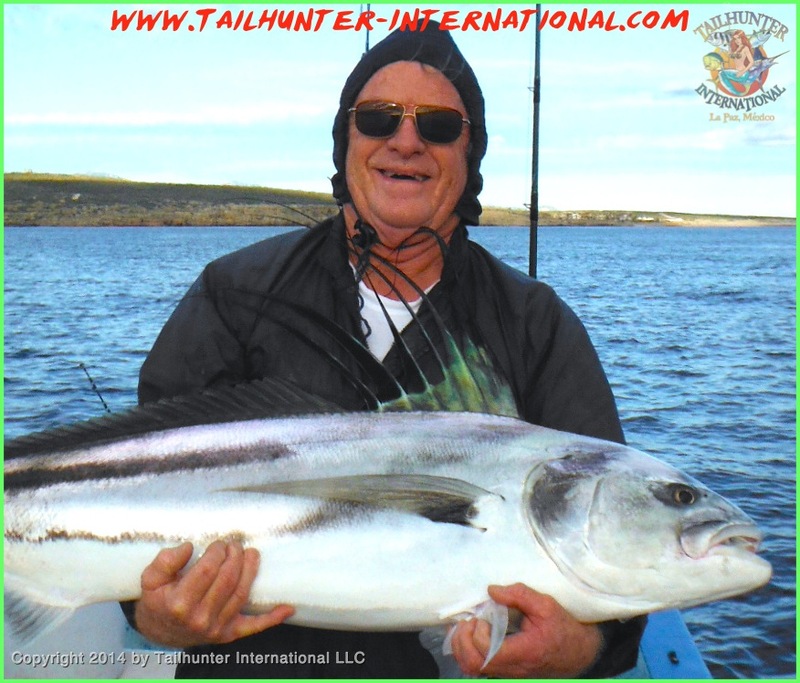 In fact, it was one of our better weeks for the inshore fishing which combined for cabrilla, bonito and even a few smaller rooster fish. But, I’m again surprised by the continued presence of blue water fish like marlin (never had a November and December like this! ), dorado and wahoo in the area. As I’ve mentioned before, we’re ONLY fishing with our Tailhunter Las Arenas fleet. We’ve pretty much shuttered out Tailhunter La Paz fleet as it’s usually too windy or not worth it to spend 1-2 hours getting bumped around to get to the fishing grounds. Plus the bait guys just aren’t out much since there’s not many folks fishing out’ve La Paz for the same reasons. 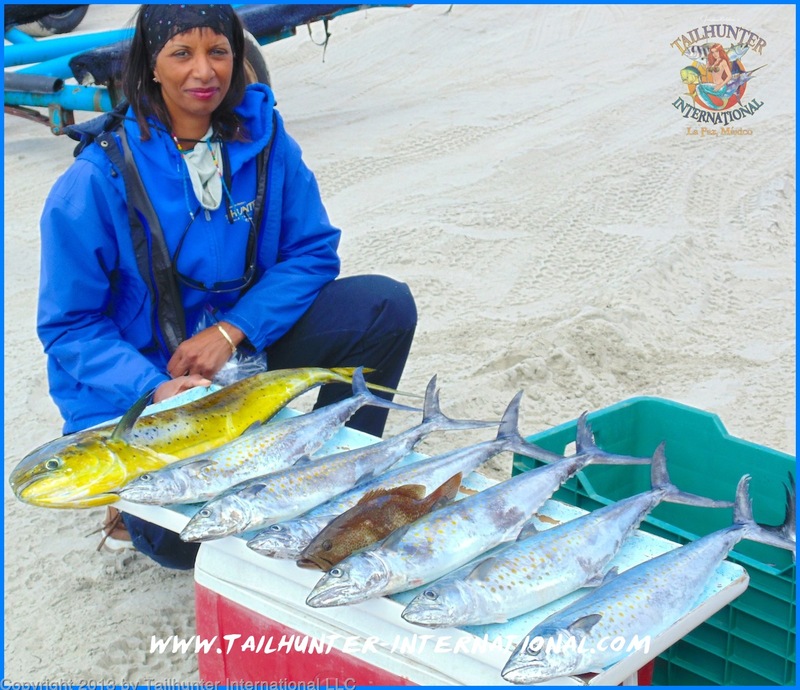 So, it just makes more sense to keep fishing with our Tailhunter Las Arenas fleet where the fish are close; there’s bait around; and even if it’s a little brisk, we’re somewhat sheltered by Bahia de Los Muertos and the lee side of Cerralvo Island. Not many anglers around this time of year so it’s kinda nice to be out there fishing and you almost have the whole Sea of Cortez all to yourself! Just a heads-up. Looks like there’s some updates for flights from the U.S. this year. Normally, Aero Mexico flies from Los Angeles to La Paz on Sundays and Thursdays. This is the ONLY flight direct to La Paz non-stop. But, it looks like they have added some Saturday flights as well! Great news. 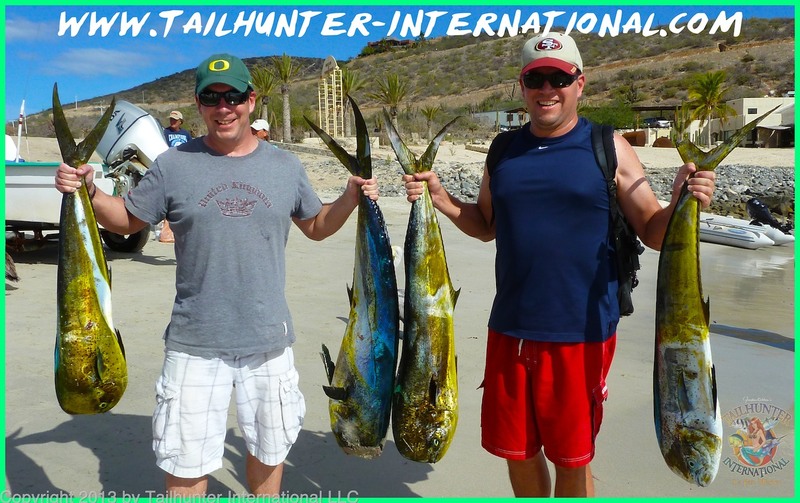 Also, most of our amigos fly to Cabo and then we have our Tailhunter shuttle come get them. Cabo is such an easy no-brainer much of the time. There’s more flights. There are daily flights. It’s usually alot cheaper flying to Cabo. With the newly completed road, it’s now just a bit over 2 hours now zooming up to La Paz! Well, Alaska Air has opened routes from Boise ID to San Diego now! San Diego is a great airport and it’s way better than flying into LAX any day! Several of our amigos and clients have already booked that flight from Idaho and are really happy with it. San Diego to Cabo is cake! That’s our story! Hope you’re having a safe and happy Christmas holidays! Quite a surprise, but wahoo are still on the chew! Happy amigo, Fernando Sucre, from the San Francisco Bay area, was able to get in one day of fishing and scored this tasty wahoo near Cerralvo Island. The presence of wahoo has been a great treat so late in the season. Recently retired amigo, Tim Zimmer, has been making the most of his free time fishing his brains out all over the country. He and his wife always make a point of visiting us in December and always do well. We had a great week of marlin fishing with most of them getting released. Check out Captain Jorge and Tim’s nice billfish. Ken Gragg is another of our frequent amigos. 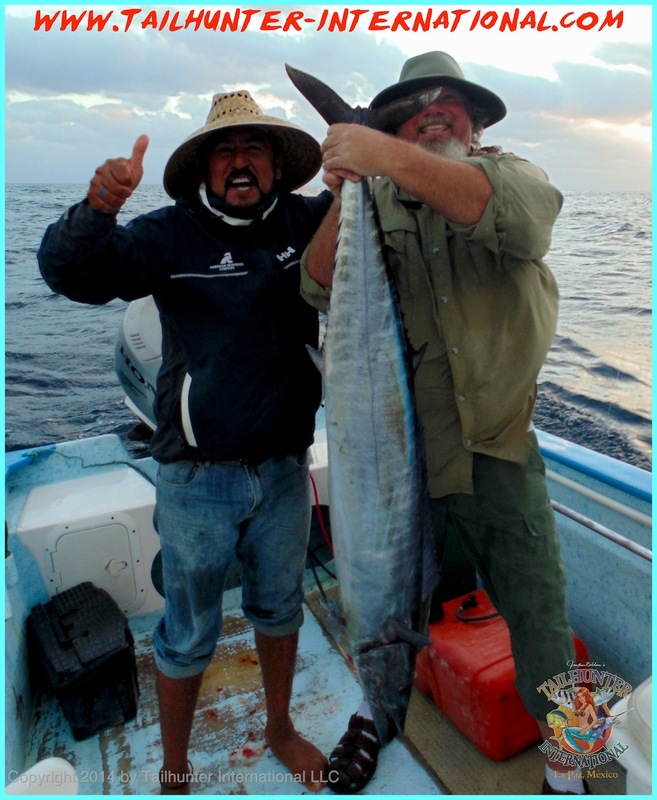 This is his 3rd trip this year, and in 2 days fishing this week with Captain Gerardo scored 4 wahoo! This one seems to be missing it’s nose, but it’s a big fish. Captain Gerardo is NFL lineman-sized guy! Check out the roosterfish! In December!!! What’s up with that? Steve Medley got in two days of fishing and scored this trophy roosterfish just off the beach to take a great photo and release the fish to fight again! It’s been the best roosterfish season in years! Another bucket list fish! Prof. Mark Marcus came to visit us from Washington also popped a big rooster this week. He’s kinda struggling with the hot fish to take the photo, but it’s a sweet fish and was released after the photo! He also got a wahoo as well! 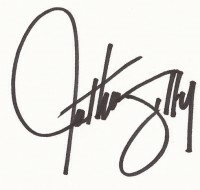 See the photo below! Some great fishing! DOUBLE ‘HOO! 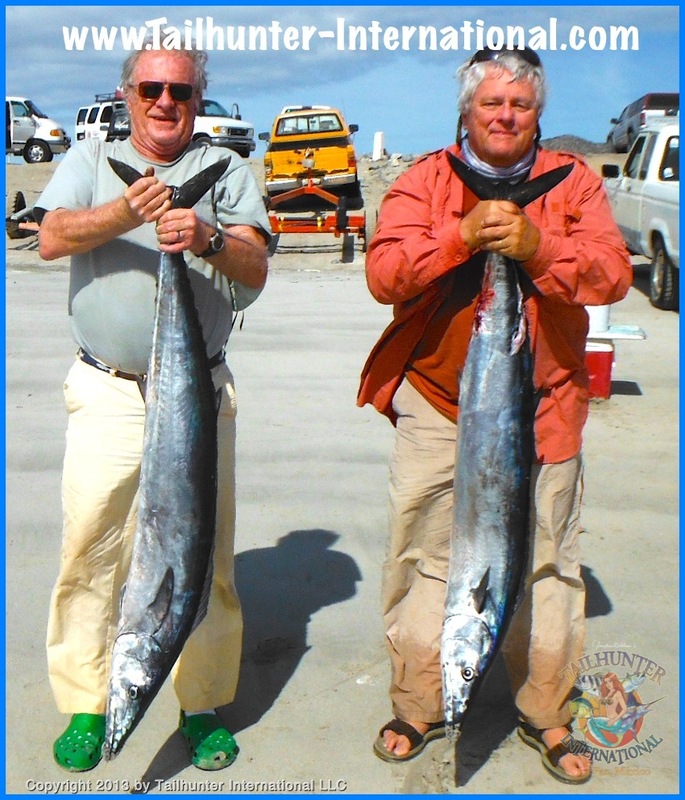 Professor Llew Williams from Florida and Professor Mark Marcus from Washington tag teamed for this double billing of wahoo off Cerralvo Island this past week. They took chunks back to our Tailhunter Restaurant for some great eats! Nicely done! 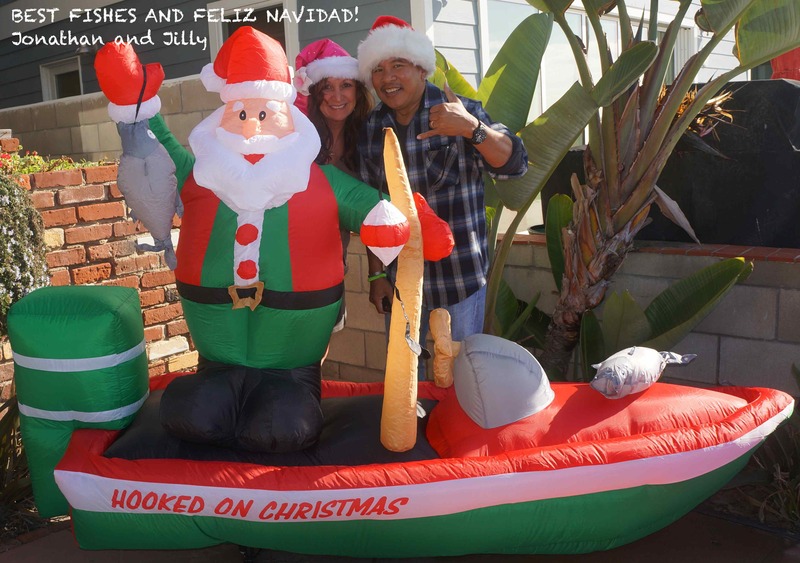 Chris and Damon Lewis are brothers who met up in La Paz for some fishing. Chris is from Mexico City and Damon lives in Redwood City near San Francisco. Yes! There’s still dorado in our waters. Normally, warm water fish, they’re still lingering in surprising numbers! CRAZY MARLIN AND WAHOO LIGHT IT UP! It has truly been a surprising end of the season here in La Paz. Mainly because the season hasn’t ended! Here it is almost Christmas. Yes, it’s getting cooler. Yes, it’s getting windier and choppier. We’re supposed to be fishing inshore right now for cabrilla, pargo, bonito, and sierra. Instead, we’ve still got blue water pelagic species still biting. And it’s not just one or two. I mean, crazily, the fish or on a serious chew! We had several days this week when almost every single one of our pangas hooked at least one or two striped marlin between 90 and 120 pounds. We’ve had several days where every panga hooked 1-3 wahoo each between 15 and 40 pounds. 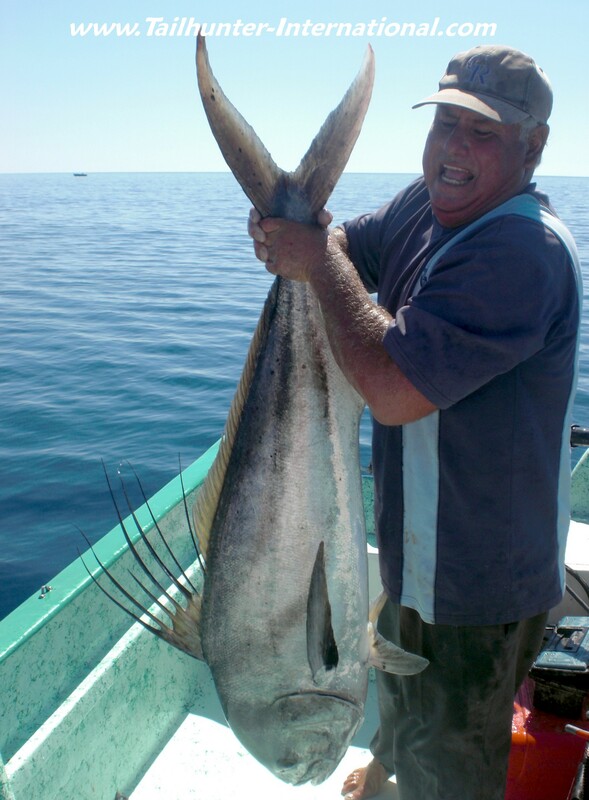 We’ve still got trophy rooster fish up on the beach up to 50 pounds. 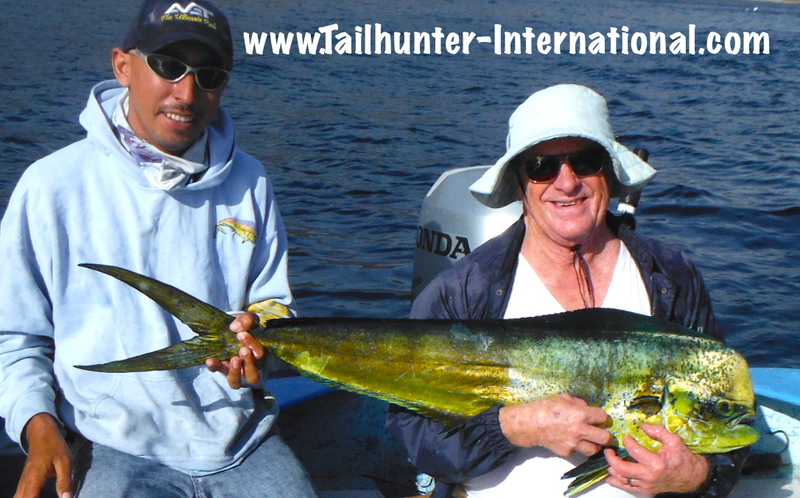 Plus, there’s schools of 10-20 pound dorado out there as well! This is more like the kind of fishing report I’d be giving in the summer or fall. Not in December. Not just a few weeks before Christmas! It’s been a wacky year, but I would never have expected this. Some days, it’s been like a buffet line. Pick and choose what kind of fish you want to fish for! I have no idea what the inshore rock fishing is like because no one is fishing for the inshore species! Maybe there are pargo and cabrilla and sierra to be caught, but those species have to be feeling ignored because just a few further yards offshore, there’s dorado and marlin and wahoo ready to bite! It’s been a great late season treat. No complaints! Hope you and yours are having a good holiday season. Best fishes. Stay safe and well! It was one of those nice tranquil holiday weeks. Not a whole lot of fishermen on the water, but a nice time to be in the area with some great weather and, not bad fishing. 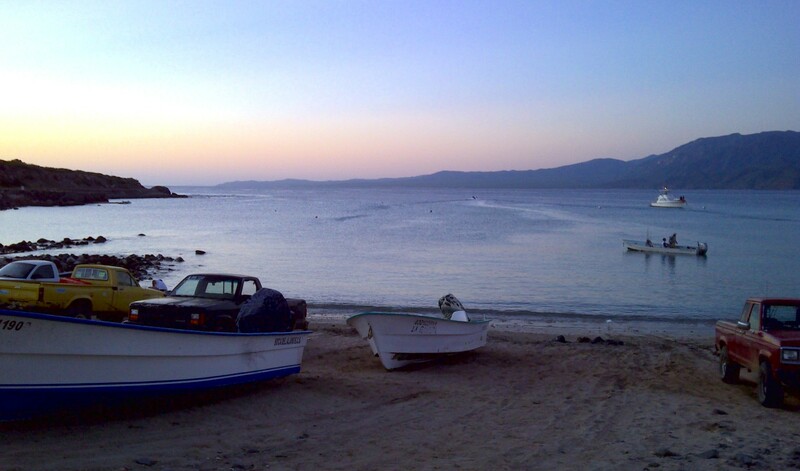 Here’s the morning view of Bahia de Los Muertos as we launch to go fishing for our Tailhunter Las Arenas Fleet. 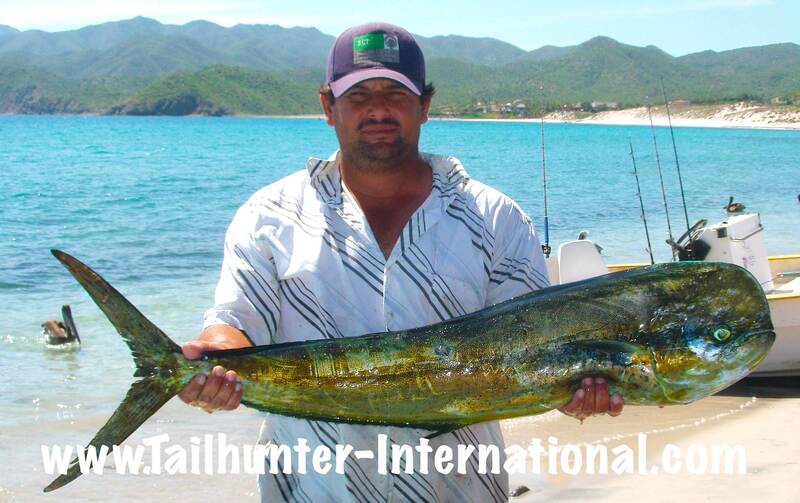 They were a little tough to find early in the week, but the dorado bite got better as the week went on with most fish about 10-15 pounds like this decent bull held by our Captain Armando on the beach at Bahia de Los Muertos. Yes! It’s hard to believe, but there are still good number of striped marlin and sailfish in the area to punctuate what has been a very good year for billfish. Most of the billfish have been running about 100-130 pounds and thankfully are getting released. Most of the catches have also been unintentionally caught when guys are fishing for other species and the line gets picked up by a billfish! A nice treat and very unexpected this late in the season! 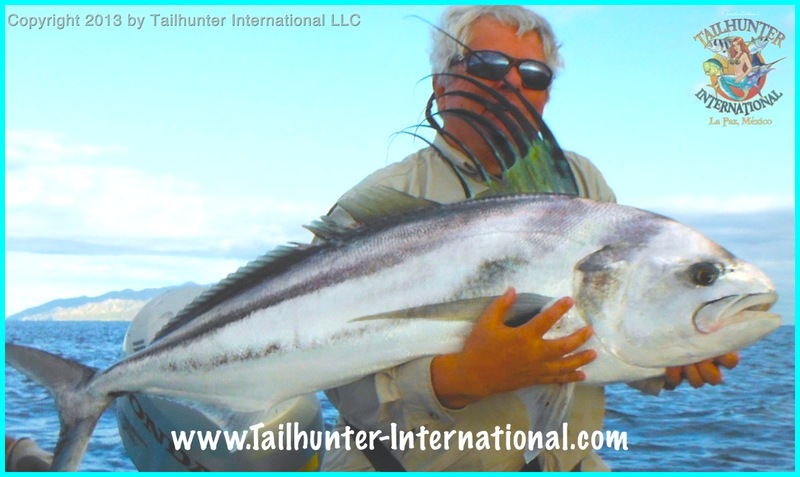 Captain Archangel hoists up another roosterfish for the camera before letting it go. Another species we don’t often see this late in the season. But, we’re finding them in the shallow waters inshore near the lighthouse. All of them are getting released. Winds and waters got a little cooler this past week and we even had little flurries of rain that threatened. We still got some fish, but overall, being a holiday weekend there just weren’t that many anglers in town. The week started rather slowly and I figured that the season changes finally caught up with us. Fishing was slow. Just a few fish here and there. But that’s what I had been expecting for about this time of year as the season changes to cooler conditions. Basically, that means fewer blue water fish like dorado and billfish and more inshore species like cabrilla, pargo, jack crevalle and sierra. So, after a few so-so fishing days early in the week, I was about ready to call it and say the warm-water species are gone. But, then as the week went on, fishing got better. We started hitting more dorado schools. We had a few biters from billfish (sailfish and marlin) and even got a few nice-sized rooster fish! The dorado do seem a bit more scattered, but it’s great that they are still around. Likewise, the roosters are where you’d expect them…around the Las Arenas lighthouse and off Punta Perrico, but the fact that they are even here this late in the season is kinda cool! The marlin? Who knows! It seems that every day at least one of our pangas is getting hooked up and more often-than-not, several hookups a day. I think the waters are still warm enough to hold them in the area, plus there are still some big schools or bonito in the area which is perfect food for the billfish. So, as of my writing, there’s still some pelagic species running around. Again, I’m not sure how long this will last, but we’ll enjoy it as long as we get it. The forecast for the coming week calls for some increasing winds and even a slight chance of rain so we’ll have to keep an eye out. That’s our story! Hope everyone had a great Thanksgiving weekend!